Background: Whether acute MS lesions are primarily inflammatory or demyelinative is unresolved. Our study examined acute MS lesions longitudinally by quantitative magnetization transfer (MT), an MRI technique that identifies tissue integrity and destruction. Methods: Four MS patients were studied by serial MRI including MT, conventional T2-weighted images, and postgadolinium T1-weighted images for 9 to 12 months. In 15 new lesions, the MT ratio (MTR) was calculated retrospectively. Results: In 13 lesions, a marked decrease in the MTR was present early during the first 2 months after the onset of the lesion and was followed by a variable increase. In two other lesions, the MTR progressively declined. Conclusions: These results suggest that major early structural changes compatible with demyelination and followed by remyelination and gliosis, or by continuous demyelination, occur in new MS lesions. The various MTR profiles provide in vivo confirmation of the current knowledge of the progression in MS lesions. Furthermore, MTR may be used to monitor in vivo drug efficacy in new MS lesions. MS is a demyelinating disease of the CNS.1 Although its etiology and pathogenesis are unknown, genetic, environmental, and immunologic factors play a role.1 As in experimental allergic encephalomyelitis (EAE), immunologic factors are of central importance in MS. The very early stage of MS lesion formation is characterized by inflammatory disorders with mononuclear infiltrates, edema, and local disturbances of the blood-brain barrier (BBB). Studies using MRI have shown BBB breakdown by gadolinium enhancement at the very onset of MS lesions.2,3 When and to what degree demyelination occurs in MS lesions is questionable. Pathologic studies have shown that demyelination and remyelination occur in MS lesions very early after onset.4-9 However, demyelination and remyelination are harder to confirm in vivo because of current techniques available. Magnetization transfer (MT) imaging is an MRI technique based on the specific interaction between macromolecules and water protons.10 The quantitative MT ratio (MTR) has been used recently to investigate the degree of CNS tissue damage in numerous diseases.11-14 Normal white matter (WM) has a high MTR because of the strong interaction between macromolecules of the myelin membrane, such as cholesterol and galactocerebroside, and water protons.15,16 Several experimental studies with histologic correlation, including EAE, bystander toxic demyelination, and wallerian degeneration, have demonstrated a close relation between the decrease in MTR and the degree of tissue destruction.11,17,18 Purely edematous lesions have a very low MTR decrease; however, the greater the destructive process, the greater the MTR decrease. In vivo studies of patients with progressive multifocal leukoencephalopathy (PML) have shown that their lesions have a very low MTR, which correlates well with the specific demyelinating process of this disease.19 In MS, the MTRs of lesions vary greatly, which also corresponds to the pathology of the disease.11 Furthermore, the correlation between patient disability and MTR has been established.12 In optic neuritis and osmotic demyelination, MT correlates with disease severity better than other imaging techniques and electrophysiology.20,21 Therefore, MT is widely believed to be a useful quantitative tool to investigate specifically the degree of tissue destruction in the CNS. Of course, within the WM, tissue destruction may include demyelination as well as axonal loss, and the difference between the two is difficult to assess. In a previous study, we measured longitudinal MTR of chronic lesions and were surprised by the small amount of variations of MTR values over time.22 We therefore studied acute MS lesions by selective MTR examination of new, acute MS lesions to determine the structural changes that occur after onset of the lesion during a 9- to 12-month period. Methods. The study was designed to observe the onset of new lesions on MRI and to follow their development during at least 9 months by monthly or trimonthly scans. Four patients (mean age 34, standard deviation 11) with definite MS were included in the study. Clinical characteristics of their disease are indicated in the table. During the study period, three patients were under treatment for MS (one with steroids, another with mitoxantrone, and a third with cyclophosphamide). Before each MRI examination, patients' Expanded Disability Status Scale (EDSS) scores were determined by a single neurologist. MRI studies were conducted on a 1.5-Tesla device. The recommendations for patient repositioning defined by Miller et al.23 were followed strictly. The MRI protocol started with a localizer to obtain reproducible examinations over time. The axial plane was defined as tangential to the anteriormost and posteriormost aspects of the corpus callosum. A contiguous 10-slice MT sequence was done with the central part of the lower slice positioned at the center of the roof of the fourth ventricle. Using a slice thickness of 5 mm, the CNS was imaged from the upper part of the posterior fossa, including the cerebellar peduncles to the middle part of the centrum semiovale. The MT sequence was a MT pulse of gaussian shape centered 1,500 Hz off-resonance, with a duration of 8.192 ms. The imaging sequence was a gradient echo with a repetition time of 600 ms, an echo time of 12 ms, and a flip angle of 60 degrees. Two sequences were done to calculate the MTR: one with an MT pulse strength of zero and the other with a strength of 15.5 × 10-6 Tesla. The sequences were a conventional T2-weighted (T2-WI) spin-echo and a postgadolinium (0.1 mmol/kg of gadolinium DTPA) T1-weighted (T1-WI) spin-echo sequence. The slice thickness and positioning of both sequences were identical to the MT sequence. Two patients were scanned almost every month for a period of 9 to 12 months, with a total of eight studies. Two patients were scanned every 3 months, and had four MR studies during 9 months and the other five MRI studies during 12 months. Additionally, 10 volunteers of comparable age (35 ± 14) with no neurologic history had MT studies to determine both the interindividual reproducibility of the technique and the average MTR in normal WM using this technique. Analysis. The first MRI study was considered as the baseline scan. Nascent or acute MS lesions were defined as the onset of an abnormal signal intensity either on the postgadolinium or the T2-WI on one of the subsequent MRI examinations in an area that was lesion free on the baseline scan. MTR were calculated using the equation: MTR = (1 - [Ms/Mo]) × 100 where Ms is the magnitude of signal under MT saturation and Mo is the magnitude of signal without MT saturation. MTR were calculated by means of a cursor in the region of interest within the lesion, and in the contralateral side in a normal-appearing WM (NAWM) area. To minimize partial volume averaging, only lesions with a diameter of at least 5 mm at onset were analyzed. The cursor size was chosen to fit inside the lesion edges. An MTR profile was established by measuring the MTR at the site of the lesion before onset and during the subsequent MRI studies. This was compared with the MTR profile of the contralateral side. The presence of gadolinium enhancement and visibility of the lesion on T2-WI was also recorded to compare quantitative MT with the qualitative analysis from conventional MRI. Results. Fifteen nascent MS lesions that fulfilled the aforementioned criteria were observed in the four patients (see the table). All were detectable on T2-WI, and 12 were also enhanced on the postgadolinium T1-WI. The three nonenhanced acute lesions occurred in the patients with a 3-month delay in scanning. By the end of the study, 12 lesions were still present on T2-WI, whereas 3 had disappeared. None was enhanced at that time. The average MTR calculated from the site of the lesions on the baseline scan before their appearance was 47.6% ± 1.9 (SD), similar to the average MTR calculated on the WM of the volunteers (46.6% ± 2.3). Figure 1 shows an acute lesion and individual MT profiles of several lesions are shown in figure 2. Although each lesion has a particular MTR profile, the most common characteristic of the MTR profiles in 13 of the 15 lesions was the decrease in the MTR at the very early stages of the lesion simultaneous to its appearance on T2-WI or to gadolinium enhancement. The lowest MTR value occurred at the initial scan or in a few lesions at the next scan. The mean MTR value at the maximum decrease was 28.3% ± 8.5%. Three lesions had their lowest value between 10% and 20%, four between 21% and 30%, and six between 31% and 40%. The lowest value (12%) was found in lesion 4 of Patient 1, and the highest value (38%) in lesion 1 of Patient 1. In these lesions, the MTR increased and then stabilized either close to the normal range (see figure 2a) in five lesions (mean MTR of 43.2% ± 2.6%) or below the normal range in eight lesions (see figure 2, b and c) (mean MTR of 34.1% ± 2.6%). A different pattern occurred in two other lesions: a progressive MTR decrease with the lowest MTR value at the last MRI study (see figure 2d). Figure 1. Example of an acute MS lesion observed in Patient 1. (a) Baseline MRI study: spin-echo T2-weighted (T2-WI). (b) Month 2 MRI study: T2-WI shows an acute lesion (arrow). (c) Month 2 MRI study: postgadolinium T1-WI. Enhancement of the nascent lesion is visible. (d) Month 9 MRI study: T2-WI. The lesion size is reduced. Figure 2. 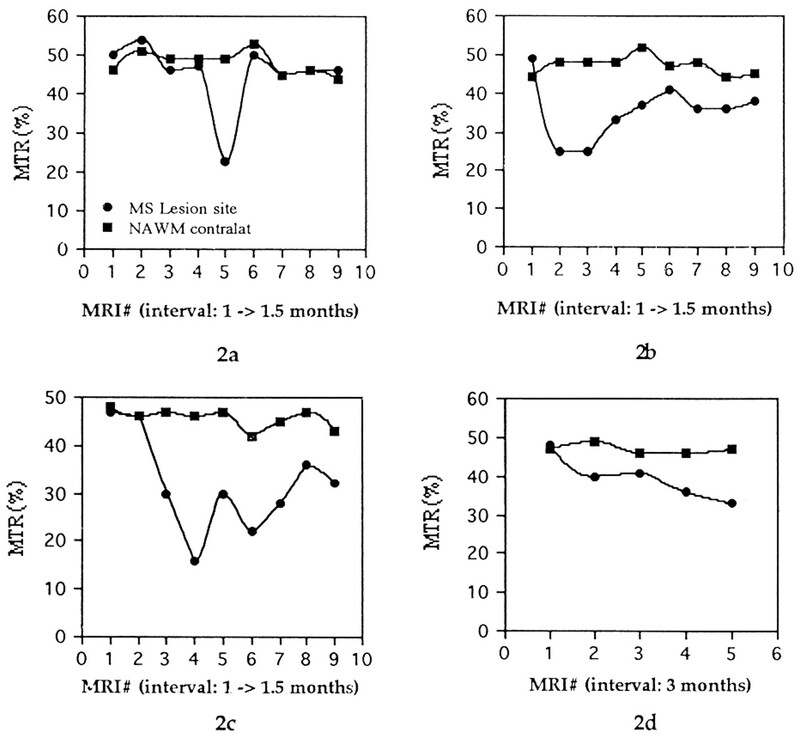 Magnetization transfer ratio (MTR) profiles in four lesions. (a) Patient 1. MTR profile within one lesion and of the normal-appearing white matter (NAWM) contralateral side. There is a marked decrease in the MTR at the onset followed by a rapid normalization. (b) Patient 2. Marked MTR decrease at the onset followed by a progressive increase, but MTR values remain below normal. (c) Patient 1. Marked decrease in MTR, maximal 1 month after the onset. Progressive increase but MTR values remain below normal. (d) Patient 4. Progressive MTR decrease during 12 months with no increase. Several patterns were found concomitantly in the same patient. An MTR increase close to normal in some lesions was associated with a subnormal MTR value in other lesions in Patients 1 and 2. Also occurring concomitantly were an MTR increase and a progressive MTR decline in Patient 3. This is of interest because it indicates that various structural changes may occur simultaneously in the same individual. The comparison between quantitative MT and conventional MRI technique showed that lesions with low MTR had persistent abnormalities on T2-WI, whereas among the five lesions whose MTR returned almost to normal, three lesions were no longer visible on the T2-WI (MTR values were 40%, 42%, and 46% for these three at the last MRI study). Gadolinium enhancement, present in 12 lesions at the early stage, did not last longer than 2 months. There was no correlation between the presence of gadolinium enhancement and the degree of MTR decrease. However, because three patients were receiving therapy (including steroids and mitoxantrone), the lack of gadolinium enhancement may have been affected by the treatment. Discussion. The goal of this study was to determine the timing and degree of extent structural changes occur in acute MS lesions in the weeks or months after onset. Most current knowledge about the neuropathology of MS is based on the study of late chronic MS lesions characterized by a sharply demarcated area, where myelin sheaths are selectively destroyed with relative axonal preservation and dense glial scar formation.1 There are few data on the features associated with the initiation and development of acute lesions. The ability to analyze acute MS lesions is limited, requiring either biopsies (this only for the larger plaques), or autopsy tissue from patients deceased during an acute relapse. Another limitation of current neuropathologic examination is the lack of data for the same lesion during a particular period. Because pathologic examinations are not obtainable in patients in vivo, the present study could not correlate imaging findings with pathologic changes. However, we used a well-established imaging technique for tissue content analysis. Furthermore, because experimental work comparing MTR with pathologic findings already exists, the interpretation of MTR profiles in humans may be facilitated. In our study, three MTR profiles occurred: 1) a marked MTR decrease at the onset and during the following month, followed by a rapid or progressive quasinormalization; 2) a marked decrease followed by incomplete normalization; and 3) a progressive decrease with no increase by the end of the study. The most common feature was a marked decrease in the MTR at the very acute stage of MS lesions. The same observation was reported by Gass et al.24 in acute lesions of an MS patient. In MS, and MTR decrease may be caused by edema and by macromolecular loss from demyelination possibly associated with axonal loss. However, such a marked decrease more likely corresponds to a destructive process than to edema, which is usually associated with a slight MTR decrease.11,14 A marked MTR decrease has been described in destructive processes such as PML, experimental toxic demyelination, and MS lesions.11,12,14,19 Our study clearly indicates that important structural changes occur very early at the onset of MS lesions during the inflammatory phase. Considering the pathologic process of MS, the most specific structural change that may have occurred is demyelination. The other process that may have decreased the MT ratio is axonal membrane loss, which may have contributed in part to the decrease. Of course, we cannot differentiate the two processes, but because 13 to 15 lesions had increasing MTR values after the decrease, it is unlikely that axonal loss is reversible. The MTR increase in 13 of 15 lesions after an initial decrease may be due to fading of edema, remyelination, and gliosis. The exact role edema plays in MTR in these lesions is unknown. However, because edema usually modifies the MTR only slightly, lessening edema cannot be the main cause of such an MTR increase.11,14 The marked MTR increase observed in most of the lesions indicates that the structure itself undergoes reorganization. In the pathologic process of MS, the two phenomena that may increase the macromolecular content of lesions are remyelination and gliosis, both of which provide additional membranes for the lesions. As already mentioned, neuropathologic examinations show that in most acute and early MS lesions, the oligodendrocytes are largely preserved and capable of remyelination.4-9 Although we cannot conclude what exactly accounts for the MTR increase, a remyelinating process may well explain much of the phenomenon because the myelin membrane has numerous sites of exchange with the water molecules.15,16 Among three lesions that were no longer visible by the end of the study on T2-WI and postgadolinium T1-WI, two had an MTR slightly below the normal range. This may help to explain the NAWM abnormalities, which may be caused at least partly by vanishing lesions. Another feature less frequent in our study was a progressive MTR decrease with absence of MTR increase. We believe this may be resulting from a continuous demyelination eventually leading to axonal loss. Of note, it occurred in one patient who concomitantly had another lesion with a different pattern. By documenting varied, distinct MTR profiles, our study supports the multiplicity of pathogenetic pathways for demyelination and remyelination.9,32 Recently, Lucchinetti et al.,9 in a study of 104 patients with 82 cases of early MS and 16 cases of acute MS, described five distinct patterns of lesional pathology: 1) demyelination with no or minor oligodendrocyte loss; 2) demyelination with concomitant destruction and loss of oligodendrocytes; 3) primary demyelination with a gradient of oligodendrocyte loss toward the inactive plaque center; 4) destructive plaque; and 5) demyelinating plaques with oligodendrocyte destruction in the periplaque WM. Pathologic studies in their report showed multiple histologic features may occur at the same time in distinct lesions. This also occurred in our study where different MTR profiles were present simultaneously. Because we examined only 15 lesions, it is likely that other patterns might emerge using MTR profiles more widely. Lucchinetti et al.9 proposed that the severity of the pathogenetic process in a given lesion might determine its structural outcome. In our study, the initial severity of structural changes was not necessarily predictive of the structural outcome, as shown by the lesion MTR profile in figure 2a, which demonstrates very low MTR at onset but normal MTR after 2 months; this does not contradict Lucchinetti et al., because MTR measurements cannot differentiate myelin destruction from oligodendrocyte destruction. Another finding is the stabilization of the MTR values in most of the lesions by the end of the study. Our group, in a 1-year MTR study of chronic MS lesions, did not find any significant changes.22 Therefore, it is possible that pathologic changes during the first months of nascent lesions are the most important; the lesion might later become inactive with no major structural changes, at least for the center of the lesion. This study may have implications with respect to the design of future therapeutic strategies in MS. The existing criteria used for a clinical trial, usually gadolinium enhancement or T2-WI lesion load, may not accurately reflect the specific pathogenetic substrata of the disease. Because the hallmark of MS is demyelination, more selective techniques such as MT may lead to the development of therapeutic strategies designed to target subtypes of demyelination pathways. The authors thank Stéphane Mièze for computerized data analysis and Ray Cooke for linguistic help. Received May 20, 1997. Accepted in final form May 29, 1998. Raine CS. The Dale E. McFarlin memorial lecture: the immunology of the multiple sclerosis lesion. Ann Neurol 1994;36:S61-S72. Kermode AG, Thompson AJ, Tofts P, et al. Breakdown of blood-brain barrier precedes symptoms and other MRI signs of new lesions in multiple sclerosis: pathogenetic and clinical implications. Brain 1990;113:1477-1489. Grossman RI, Gonzales-Scarano F, Atlas SW, Galetta S, Silberberg DH. Multiple sclerosis: gadolinium enhancement in MR imaging. Radiology 1986;161:721-725. Prineas JW, Kwon EE, Goldenberg PZ, et al. Multiple sclerosis: oligodendrocyte proliferation and differentiation in fresh lesions. Lab Invest 1989;61:489-503. Prineas JW, Barnard RO, Kwon EE, Sharer LR, Cho ES. Multiple sclerosis: remyelination of nascent lesions. Ann Neurol 1993;33:137-151. Raine CS, Wu E. Multiple sclerosis: remyelination in acute lesions. J Neuropathol Exp Neurol 1993;52:199-205. Ozawa K, Suchanek G, Breitschopf H, et al. Patterns of oligodendroglia pathology in multiple sclerosis. Brain 1994;117:1311-1322. Brück W, Schmied M, Suchanek G, et al. Oligodendrocytes in the early course of multiple sclerosis. Ann Neurol 1994;35:65-73. Lucchinetti CF, Brück W, Rodriguez M, Lassmann H. Distinct patterns of multiple sclerosis pathology indicates heterogeneity in pathogenesis. Brain Pathol 1996;6:259-274. Wolff SD, Balaban RS. Magnetization transfer contrast (MTC) and tissue water proton relaxation in vivo. Magn Reson Med 1989;10:135-144. Dousset V, Grossman RI, Ramer KN, et al. Experimental allergic encephalomyelitis and multiple sclerosis: lesion characterization with magnetization transfer imaging. Radiology 1992;182:483-491. Gass A, Barker GJ, Kidd D, et al. Correlation of magnetization transfer ratio with clinical disability in multiple sclerosis. Ann Neurol 1994;36:62-67. Filippi M, Campi A, Dousset V, et al. A magnetization transfer imaging study of normal-appearing white matter in multiple sclerosis. Neurology 1995;45:478-481. Metha RC, Pike GB, Enzmann DR. Measure of magnetization transfer in multiple sclerosis demyelinating plaques, white matter ischemic lesions, and edema. AJNR Am J Neuroradiol 1996;17:1051-1055. Fralix TA, Ceckler TL, Wolff SD, et al. Lipid bilayer and water proton magnetization transfer: effect of cholesterol. Magn Reson Med 1991;18:214-223. Kucharczyk W, Macdonald PM, Stanisz GJ, Henkelman RM. Relaxivity and magnetization transfer of white matter lipids at MR imaging: importance of cerebrosides and pH. Radiology 1994;192:521-529. Dousset V, Brochet B, Vital A, et al. Lysolecithin-induced demyelination in primates: preliminary in vivo study with MR and magnetization transfer. AJNR Am J Neuroradiol 1995;16:225-231. Dousset V, Armand JP, Lacoste D, et al. Magnetization transfer study of HIV encephalitis and progressive multifocal leukoencephalopathy. AJNR Am J Neuroradiol 1997;18:895-901. Thorpe JW, Barker GJ, Jones SJ, et al. Magnetization transfer ratios and transverse magnetisation decay curves in optic neuritis: correlations with clinical findings and electrophysiology. J Neurol Neurosurg Psychiatry 1995;59:487-492. Miller DH, Barkhof F, Berry I, Kappos L, Scotti G, Thompson AJ. Magnetic resonance imaging in monitoring the treatment of multiple sclerosis: concerted action guidelines. J Neurol Neurosurg Psychiatry 1991;54:683-688. Gass A, Moeckel R, Hennerici MG, Schwartz A. Assessment of tissue changes in multiple sclerosis lesions using frequent serial magnetization transfer ratio imaging. In: Proceedings of the 3rd Society of Magnetic Resonance, Nice, 1995:1294. Abstract. Grossman RI, Braffman BH, Brorson JR, Goldberg HI, Silberberg DH, Gonzales-Scarano F. Multiple sclerosis: serial study of gadolinium-enhanced MR imaging. Radiology 1988;169:117-122. Miller DH, Rudge P, Johnson G, et al. Serial gadolinium enhanced magnetic resonance imaging in multiple sclerosis. Brain 1988;111:927-939. Stone LA, Frank JA, Albert PS, et al. The effect of interferon beta 1b on blood-brain barrier disruptions demonstrated by contrast enhanced MRI in relapsing remitting multiple sclerosis. Ann Neurol 1995;37:611-619. Wolinski JS, Narayana PA, Fenstermacher MJ. Proton magnetic resonance spectroscopy in multiple sclerosis. Neurology 1990;40:1764-1769. Roser W, Hagberg G, Mader I, et al. Proton MRS of gadolinium-enhancing MS plaques and metabolic changes in normal-appearing white matter. Magn Reson Med 1995;33:811-817. Davie CA, Hawkins CP, Barker GJ, et al. Serial proton magnetic resonance spectroscopy in acute multiple sclerosis. Brain 1994;117:49-58.